I’m going to go out on a limb here – a very, very short limb, I accept – and state that French food is the best in the world. It’s the mothership of cuisines, the place that anybody with any interest whatsoever in food or eating eventually comes back to. There’s good reason for this, of course, good reason etched in the centuries of culinary tradition and supremacy that’s central to French culture. The French know food, and are fiercely proud of that fact, as well they should. 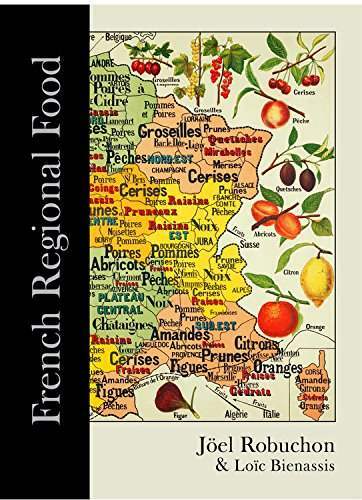 In that sense, Joël Robuchon and Loïc Bienassis’ French Regional Food is different, more of a travelogue and encyclopedia than a cookbook, a journey around the French regions, exploring the wonderful culinary richness that France has to offer, with some recipes added in. There are only about fifty recipes, so this isn’t the book for anybody looking for a detailed run-down of French classics, but those fifty are all finely tuned and beautifully presented. They feel do-able, which is my long-standing acid test for any cookbook. Recipes aren’t an afterthought here, but they feel as if they take second place to the exhaustive and detailed descriptions of the produce, techniques and traditions that form the bulk of the book, and it’s here that French Regional Food becomes utterly engrossing. Arranged geographically, covering the whole of the country, Robuchon and Bienassis write with insight and knowledge about the cuisine of their land, and draw on lifetimes worth of experience to present a magnificently researched, wonderfully illustrated and authoritatively written. Don’t buy this if you want that single cookbook that contains every last French classic, but do buy it if you want a book that’s great to read, and that captures the essential spirit of France and its food.